When this film debuted in the summer of 1980, little note was made of it other than being a ripoff of "Star Wars". However, long after its initial release, this film has had a renaissance of sorts, and is being rightly rediscovered as not only paying homage to "Star Wars" but a great many other films as well. Many of the actors and crew members have created vibrant careers for themselves as a result of their work in this film and have gone on to even larger successes. 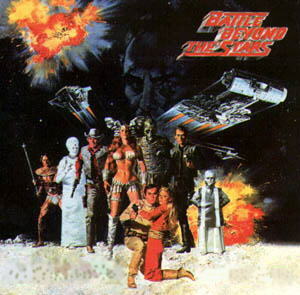 The purpose of this website is to focus on every aspect of this film and to celebrate the work of all the people (and aliens) who made "Battle Beyond the Stars" a film that is, as time has proven, ripe for rediscovery. Thank you for visiting this website and for being a fellow fan of a great movie! Copyright, June 1998. George Litman, Webmaster (litman_us@yahoo.com - BerrySpring@excite.com). All pictures, information and materials on this site retain their original copyrights and are protected to the fullest extent of the law. For full copyright information, please contact the initial copyright holders.